Swift Shift Removals are a specialist removals company offering domestic removals, commercial removals and storage services. Storage Swift Shift Removals offer storage to the highest standards to take the stress away from customers on the removal day. Allows customers to calculate how much storage and / or removal space is required and receive email confirmation. If you would like a quote please complete our contact form or call any of the numbers above. 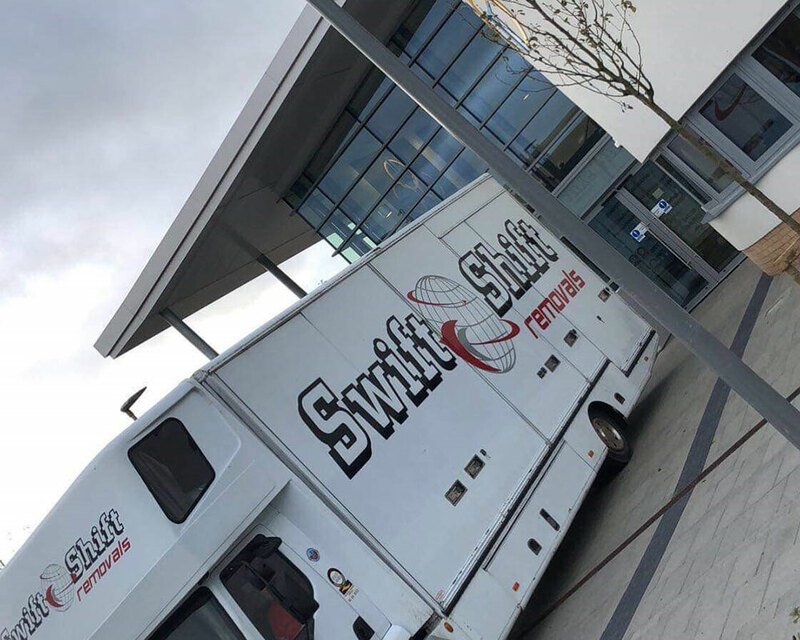 Swift Shift Removals are a family run business who specialise in domestic and commercial removals in Belfast and containerised storage and has been in operation since 1984. Based in Antrim, approximately 18 miles from Belfast, the company is ideally located to cover the whole of Northern Ireland, as well as offering a service for removals locally and nationally to England, Ireland, Scotland and Wales. We are continually looking for new ways to improve our service, and have been members of the British Association of Removers since 2011. Through our membership of BAR we have achieved a number of accreditations which we are extremely proud of. All of these accreditations can be viewed below. With our main depot in Antrim being located just a short distance from the motorway, we can get to 90% of jobs within 1 hour, including the likes of Belfast, Lisburn, Ballymena and Bangor. This, combined with our fleet of 7 lorries and 2 luton vans, means there is no job we can’t do – no matter the size or the distance. Swift Shift Removals offer a professional packing service ensuring that the removal crew will pack your miscellaneous effects into a variety of appropriate removals cartons. An inventory will be taken of your goods and a copy will be provided as a receipt on removal day. Customer's effects will be wrapped and loaded and transported to your new property. Swift Shift provide storage in Antrim, offering 51,000 sq ft of containerised dry and rodent free storage. Our purpose built storage containers are standard 6ft x 7ft x 7ft, clip sealed holding 250 cubic feet of household goods and personal effects. We currently have 1800 wooden storage containers throughout our four purpose built warehouses. Each storage container has its own unique identification number. Our storage containers are designed to fork on and off our removal vehicles, which saves double-handling and ensuring a more secure move at each and every job. If you require storage, why not fill in our storage calculator to determine your requirements or give us a call for a free, no-obligation quotation? We can be reached at our Antrim, Belfast or Lisburn offices, or on the mobile. All the numbers you need are at the top of this page. We are an expanding family run business based in Antrim, Northern Ireland. Offering customers a more efficient, streamline removals service at a very competitive rate. A dedicated team of professionals are ready to handle anything, whether it's fragile or heavy goods. Swift Shift Removals offer a range of services which include removals, domestic and commercial, packing and packaging, household containerised storage and document storage and shredding.